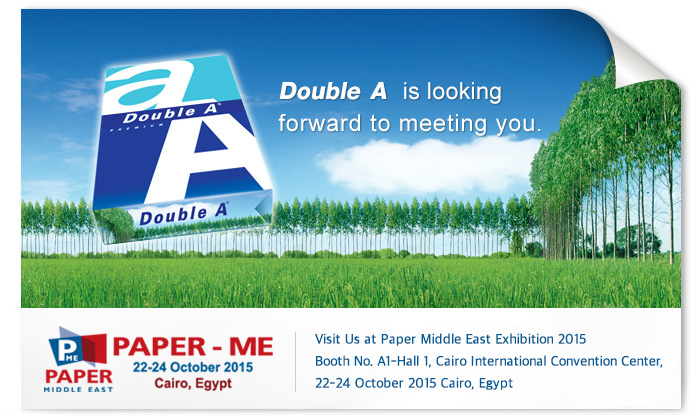 CAIRO, Egypt, 14 October 2015 – Double A is set to exhibit its range of premium quality paper at the Paper Middle East, the 7th International Exhibition for Paper, Board, Tissue, Printing and Packaging Industry. The event is taking place between 22-24 October 2015 at the Cairo International Convention and Exhibition Center (CICC). “Paper Middle East is a crucial platform to further improve our presence in North Africa, meet face to face with existing and potential customers and understand their needs. It is also the perfect platform to deliver our enduring commitment for growth in the region. Our team in Egypt is working hand in hand with our local partners and customers to further establish and develop our leading position in the Egyptian market. I am inviting everybody to visit our booth at the Paper Middle East and experience the superior quality of our paper”, said Mr. Thirawit Leetavorn, Double A Senior Executive Vice President. Double A’s superior quality is derived from its sustainable Paper Trees that are grown by over 1.5 million Thai farmers along the empty ridges that border the rice paddies. Double A Paper Trees produce unique high fiber content which gives Double A paper its high bulk, opacity and smoothness for no jam copying. Today, Double A’s quality is recognized in more than 130 countries. The future of paper industry in the Middle East and Africa is very promising. It is expected that by 2020, the region will require 28 million tons of paper to fulfil its market needs. In response, Double A is seeking to cement its presence in the region through a paper converting plant in Egypt. This will help enhance its capacity to supply the market with premium quality paper. The converting plant located in Alexandria is set to open in early 2016.